There are a number of quality Las Vegas Indian restaurants for you to visit that will surely please your taste buds and you can find a coupon for most which adds value. When you want Nepalese influenced cuisine then try Mount Everest India’s Cuisine and the Urban Turban puts a new twist on northern dishes. If you are seeking more than a buffet at lunch then Delhi Indian Cuisine or Curry Leaf Flavors of India are ideal with their a la carte menus. The India Oven Masala Bar and Grill has a live tandoori oven on their buffet and the Mint Indian Bistro boasts a lassi bar. The India Palace has been in business for 16 years and the Taj Palace will engage with your taste buds. If you are looking for a view then watch airplanes take-off at Pure Indian Cuisine and Tamba is directly on the Strip. When you want to indulge in a Las Vegas Indian restaurant that has cuisine influenced from Nepal region as well as north and south India then you need to try Mount Everest India’s Cuisine. Located along West Sahara Avenue, the establishment has a traditional Indian interior with red curtains, archways and numerous gold colored statues as well as Bollywood music playing in the background. 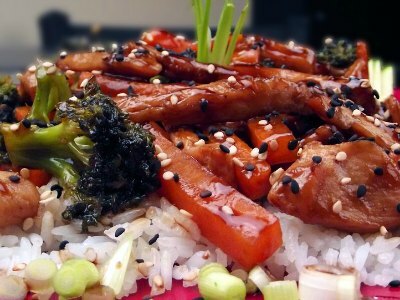 They serve a buffet for lunch which includes many dishes that are great for meat-eaters like the chili chicken and vegetarians enjoy items such as saag paneer. 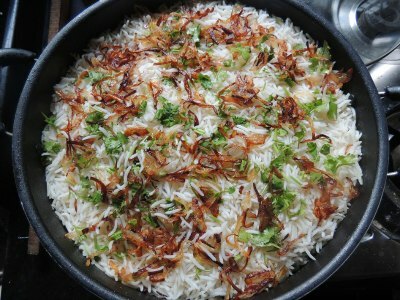 The a la carte menu for dinner has scrumptious dishes like lamb biryani, chicken pepper fry and vegetarians rave about the aloo gobi as well as the baingan bharta. Dessert offers a nice kulfi or rusmalai. When you want to add value to your meal then check Groupon online for coupons. When you are looking for a traditional Las Vegas Indian restaurant that offers quality food from around the country and an interesting lassi bar then you should try Mint Indian Bistro. Located along East Flamingo Road near the University of Nevada Las Vegas, the restaurant boasts a casual atmosphere with a simple interior that includes celebrity photographs and eclectic Indian art. The lunch buffet has many different selections on a daily basis that might range from a paneer tikka masala to malai kofta to pineapple Schezwan fried rice and there are numerous vegetarian options as well as gluten free dishes. Dinner favorites have included the Mumbai pav bhaji, the Inferno Challenge (think ghost pepper hot) and for vegans try the bhindi aloo or the vegetable korma. Another feature of the restaurant is an assortment of Indian beers and there is a unique lassi bar with dozens of flavors. 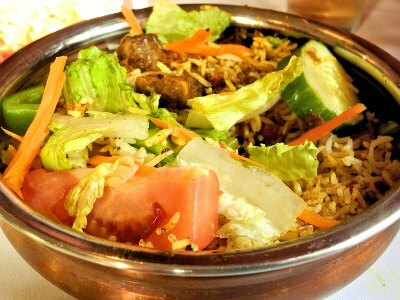 The India Palace has been pleasing guests for more than 16 years and is a nice choice when you are searching for a Las Vegas Indian restaurant that serves cuisine from the northern and southern portions of the country. Located along East Twain Avenue, the restaurant has a simple decor that is accented by numerous photographs of celebrities on the wall and features a casual atmosphere. The lunch buffet boasts a selection that ranges from tandoori chicken to goat curry as well as numerous vegetarian dishes like aloo saag and dal makhani. Dinner is served from an a la carte menu with house specialties such as lamb sagwala, fish tandoori and a rack of lamb as well as a nice vegetarian selection with favorites like paneer tikka. Dessert brings a good kheer to the table. Like many Indian restaurants search for a coupon to add value to your experience. If you like to indulge in cuisine from the northern portion of India that puts a twist on traditional dishes then a perfect Las Vegas Indian restaurant for you is the Urban Turban. Located along Paradise Road, this establishment has a chic and contemporary feel with exposed brick walls as well as an upbeat ambience. Lunch is served buffet style with a fine selection of curries, biryanis and you will find several street foods available like egg roti. The evening menu is more eclectic with offerings such as tandoori tacos, Bombay lamb masala and the butter chicken royal is a favorite as well as a big selection of vegetarian dishes like paneer butter masala. There is live music on selected nights at this restaurant ranging from jazz to traditional Indian music. The chocolate samosa for dessert rates highly with guests and you might be able to find a coupon online. If you want something other than a buffet at lunch then an ideal Las Vegas Indian restaurant for you to visit is the Delhi Indian Cuisine. Located along South Maryland Parkway in Mission Center, this restaurant offers a sleek urban interior with a casual atmosphere and numerous celebrity photographs drape the walls. You have the option here to order from an a la carte menu during lunch or indulge in a large buffet selection that is ideal for both meat-eaters and vegetarians. The buffet selection changes daily but there are always good tandoori chicken and the navratan korma for vegetarians. 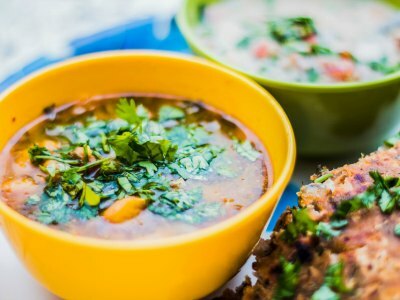 Evening boasts an extensive menu of curries, thali and chaat dishes with standouts such as nepali vegetable momos as well as the lamb korma. People rave about the freshly baked garlic naan and you can find numerous coupon options which might include dessert or a mango lassi. When you are craving to find a Las Vegas Indian restaurant that hits all marks for ambience and flavors then you should go to Taj Palace. Located along South Eastern Avenue in Henderson, this establishment has a nice atmosphere that is quiet, brightly lit with colorful lights and numerous traditional Indian murals grace the walls. 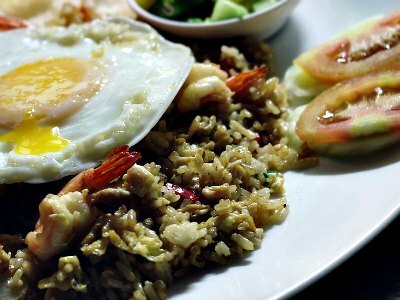 The lunch buffet features a variety of dishes that rotate daily which includes a well-rounded selection for vegetarians. An a la carte dinner menu brings flavors to your table like lamb mango curry, chicken madras, peshwari naan and the assorted tandoori (mixed grill) is a crowd pleaser. 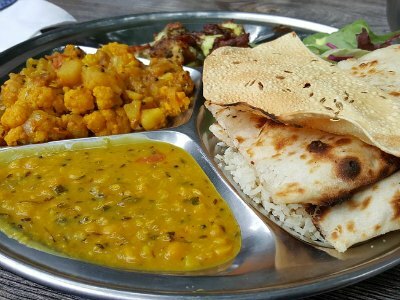 There is a wide variety of vegetarian fare that ranges from samosa to paneer options to various curries. For dessert try the house made pistachio or mango kulfi. There are coupons to be found so search Groupon. The Curry Leaf Flavors of India is a superb Las Vegas Indian restaurant that features an a la carte menu for all meals, has a hip environment and offers an alternative take on traditional dishes. Located on South Fort Apache Road, the interior offers a trendy atmosphere with numerous paintings, wall murals and brightly colored glass chandeliers. 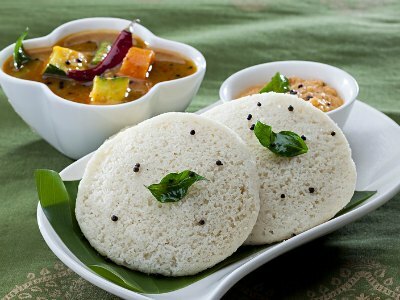 Lunch brings a pared down menu with traditional dishes like a vegetable trio samosa, various types of korma, idli sambar and kadai paneer which are all served with rice and naan. The dinner menu is more extensive with standouts being paneer tikka, lamb nihari, madras as well as plenty of selections for vegetarians such as malai kofta and the dum biryani is a favorite. Dessert is delightful and the kulfi trio is a must. The restaurant also sponsors a happy hour with an interesting Curry Leaf mojito which has a hint of curry. If you are interested in a Las Vegas Indian restaurant that serves an unpretentious meals from a buffet to an ala carte menu and has a great view of the airport then you should try Pure Indian Cuisine. Located on East Sunset Road, this restaurant has a quiet atmosphere with views of the airport runways where you can watch airplanes take-off from floor to ceiling windows. The establishment boasts a lunch buffet with over 20 food selections that range from palak paneer to butter chicken to several vegetarian dishes like tofu curry and there is complimentary naan served. 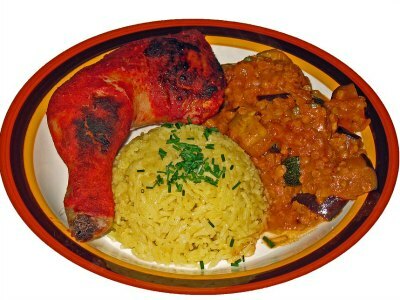 Dinner sports a large menu with favorite dishes like chicken jalfrezi, lamb rogan josh and chicken tikka masala as well as navaratan korma for vegetarians. Naan specialties include the cheese and kabuli naan is a great dessert substitute. If you are looking for value there are coupons out there to be found. The India Oven Masala Bar and Grill is a great option when you are seeking a Las Vegas Indian restaurant that features a tandoor oven preparing fresh naan and a variety of dishes from both Northern as well as Southern India. Located on East Flamingo Road near the University of Nevada Las Vegas campus, this establishment has a nice interior that features plenty of red curtains, Indian style arches, gold colored statues and a comfortable atmosphere. The lunch buffet offers a variety of 30 food items which features numerous vegetarian dishes as well as a live tandoor oven for producing naan and you are served a bottomless glass of lemonade or mango lassi. Dinner brings an extensive 7-page menu with standout favorites like lamb vindaloo, egg masala, chili paneer and tamarind chicken as well as a variety of vegetarian options. For dessert try the gajar halwa or gulab jamun. 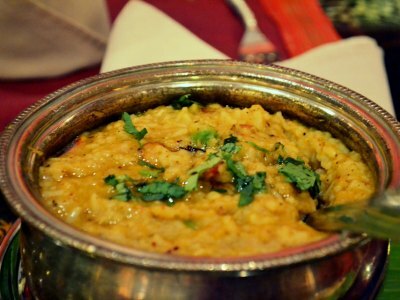 If you are searching for a Las Vegas Indian restaurant that offers a varied menu from buffets to ala carte and is ideal for all types of diners including vegetarians then try Tamba. Located along the Strip on the second floor of the Hawaiian Marketplace Plaza, the restaurant has a laid-back atmosphere that features numerous murals on the walls and an authentic Indian decor with comfortable seating options. 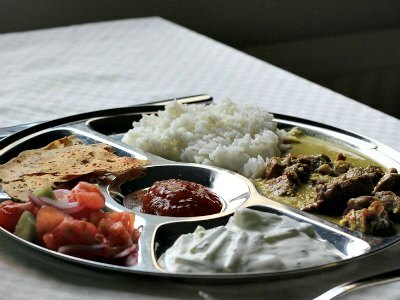 Lunch brings a buffet which includes many favorite staples such as tandoori chicken, samosa chaat, butter chicken and yellow dal. Vegetarians have a wide choice of options from paneer tikka masala to dal tadka to rotis. The evening brings a well-rounded menu of curry dishes as well as bread dishes such as lamb biryani and there is a buffet on selected evenings. The garlic naan is a must try at this establishment. People looking for value should look for a Groupon coupon.